I drive to work, and put my car keys in my pocket. Whenever I sit down in a meeting there is a 20% chance that my car keys might fall out of my pocket (unnoticed). At lunchtime, I reach for my keys and find out they are missing. If I’ve had three sit-down meetings that morning, what is the chance that the car keys fell out in the first meeting location? (You can assume the only place the keys could have fallen out is in one of those three locations). 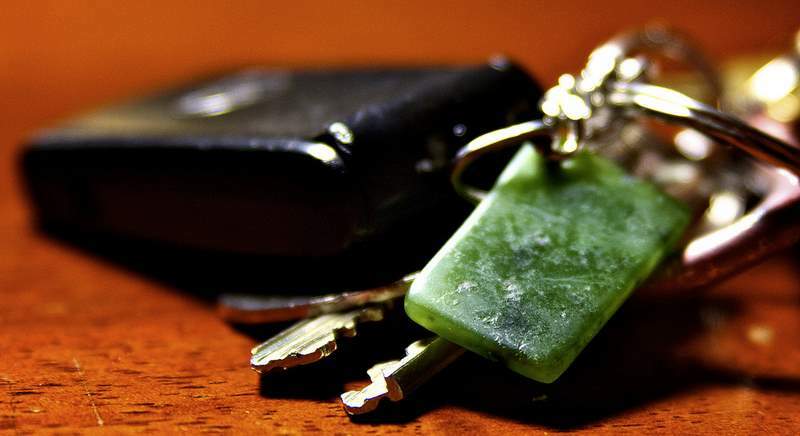 What is the chance the car keys fell out in the first meeting? A quick knee-jerk reaction might be to say “20%”, but that’s not correct. Yes, there is a 20% chance that they could fall out in any location, but we have the additional information that we know they have fallen out. What we need to calculate is that, knowing they have fallen out, the chance this happened in the first meeting. There are lots of different ways of looking at this, but probably the easiest to understand is to draw a tree diagram showing all the possible states. We know with 100% certainty that the keys were in my pocket when I arrived, and with 100% certainty they were missing at lunchtime. There is only one of three locations they could have been lost. At the first meeting, there is a 1/5 chance (20%) they could have fallen out. This means there is a 4/5 chance they could still be in my pocket at the start of the second meeting. At the second meeting, there is a the same 1/5 chance, so the probability they fell out there is 4/5 × 1/5 (They survived the first meeting, and then were lost in the second). The chance they fell out in the third meeting is 1/5, multiplied by the chance they were still around at the start of the third meeting (4/5)2. The three possible ways they could have fallen out are shown in yellow: 1/5, 4/25 and 16/125. Putting these into a common denominator we get: 25/125, 20/125 and 16/125, and we know it's one of those. Put another way, if we repeated this day 125 times, we'd expect that I'd lose my keys 25+20+16 times, which is 61 times. Of these 61 times, 25 of them would be from the first meeting, so the chance of me having lost them then is 25/(25+20+16) = 25/61 ≈ 41%. The chance they fell out in the first meeting is ≈ 41%! This is more than twice the chance that the naïve answer of 20% might suggest. I know it's a cliché that you end up finding something in the last place you look, but of course that's because you stop looking when you've found something!  What this math suggests, however, is that if you are looking for a lost item, rather than following the advice of 'retracing your steps' and going backwards from where you currently are, a better strategy is to go back to the place you last know you defintely had the item and go forwards from there. If you are familiar with Bayes' Theorem, an equivalent way of looking at this is to say that it's the probability of it falling out and it being in meeting room one out of (divided by) the probability of it falling out somewhere = (1/5) / (1-64/125).